SKB is experiencing double digit like for like revenue growth as it satisfies strong demand for skydiving, while also growing through acquisitions, and expanding its margins through increasing efficiency. Despite jump completion rates being impacted last year by poor weather, organic revenue growth was about 12%. They are guiding for a similar amount this year but, if they get normal jump completions, it would likely be about 6% higher. Analysts are not including this higher number in their forecasts. One way it is increasing efficiency is by upgrading its fleet with new engines and larger planes. The new planes are able to increase jump throughput and lower the cost per jump to SKB as demonstrated by the table below. It is also increasing its margins through acquisition cost synergies and scale benefits. We believe that there is significant international growth ahead of SKB as well as domestically in other areas of adventure experiences. SKB targets earning accretive smaller acquisitions with a multiple of 3-5times EBITDA, but with the larger ones up to 7-8 times EBITDA, and those would require a capital raise. 2. 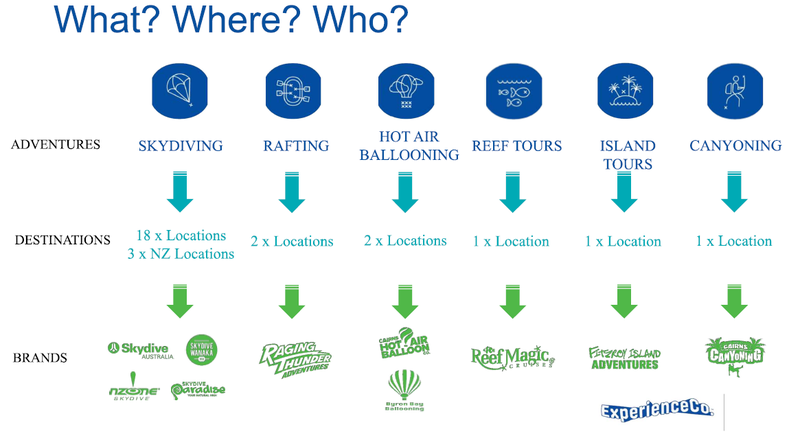 The company changing its name from Skydive the Beach to ExperienceCo. This is significant as it encompasses the company’s ambition of becoming a major adventure tourism enterprise in Australia, New Zealand and beyond. SKB followed it up by announcing a $20m acquisition and a capital raise to cover it this week. SKB is buying GBR Helicopters, which mostly flies tourists around the Great Barrier Reef, out of Cairns. Purchased for less than 5x EBITDA on a stand-alone basis, it is immediately EPS accretive, particularly given the cost and revenue synergies that will be realised. The stock rallied post the placement. At the time of writing, and on current analyst consensus forecasts for FY18, SKB is trading on an EBITDA multiple of 12x and a P/E of 22x. Given the upside earnings surprise that we expect this year, and due to the substantial growth that the company should achieve in future years, our price target is at much higher levels.